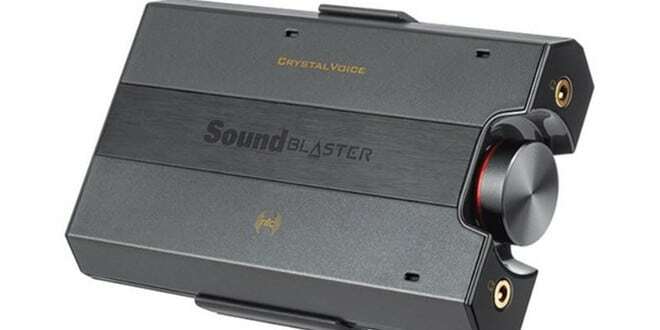 I am sure when most users hear the name Creative Sound Blaster, they think it synonymous with computer audio perfection, because many of the top gaming boards feature Sound Blaster audio. Today we will be looking at the new Sound Blaster E5 USB DAC & headphone amplifier with Bluetooth. In addition to being a USB DAC Amplifier, it features Bluetooth connectivity that allows you to wirelessly connect with your mobile devices. So can the Sound Blaster E5 live up to Creative Sound Blaster’s long legacy of audio excellence? Read on as we test the E5 and find out! Creative was founded back in back 1981 with the vision and foresight that multimedia would shape and revolutionize the way users interact and use their computers. Back then Creative revolutionized and took the industry by storm with its line of Sound Blaster sound cards and it has been an industry leader ever since. They have managed to do this through expanding their product line to cover all aspects of our multimedia lifestyles and thus we get to the Sound Blaster E5. 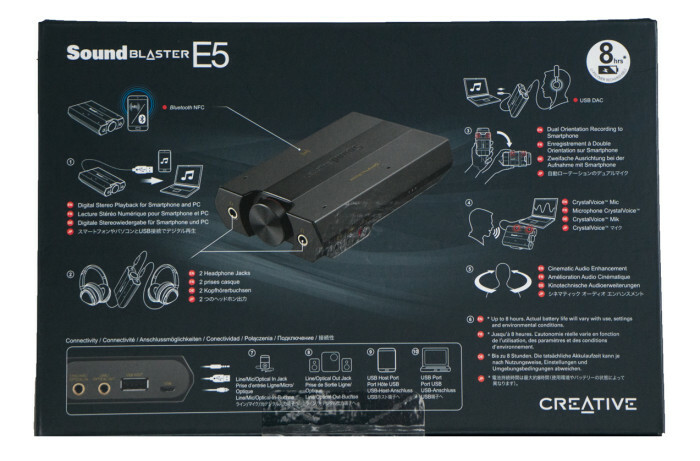 Special thanks to Creative Sound Blaster for providing us the E5 USB DAC. 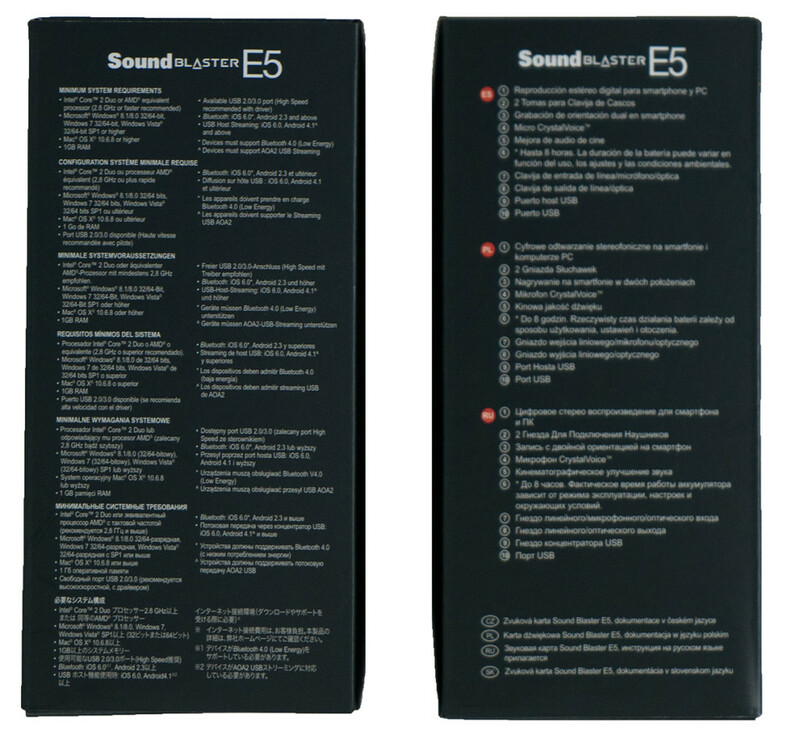 The Creative Sound Blaster E5 is wrapped in a matte flat black box with white text describing the key features of the E5. The exception to this color scheme on the packaging is the glossy Sound Blaster name in its classic red outline, glossy product picture, and the tab highlighting the SBAXX1 audio processor that is built into the E5. As with other Sound Blaster products we have reviewed, the iconic red accents are trademark features on their packaging and on key accessories like the cables. We here at Bjorn3d enjoy this bold, powerful color. 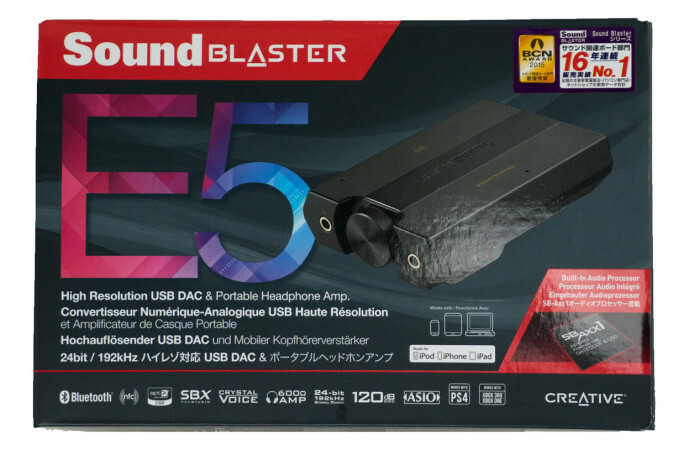 As mentioned above, the front face of the E5’s box features the legendary Sound Blaster name outlined in red, and directly below E5 done up in plaid lettering. Next to this is the glossy product picture and under this Creative highlights the key product features. On the back side of the box you find more detailed information regarding the key features of the E5, such as the Bluetooth NFC, Digital Stereo playback for Smartphone and PC, the dual headphone jack, USB DAC, dual orientation recording, Crystal Voice and the cinematic audio enhancement feature. In addition to this, the E5 features an eight-hour battery, optical in and out ports, and a USB host port and USB port. On the box ends, Creative lists the system requirements in several different languages. The top of the box has the product name in big, bold, white lettering and directions how to like them through Facebook, Twitter, and YouTube. 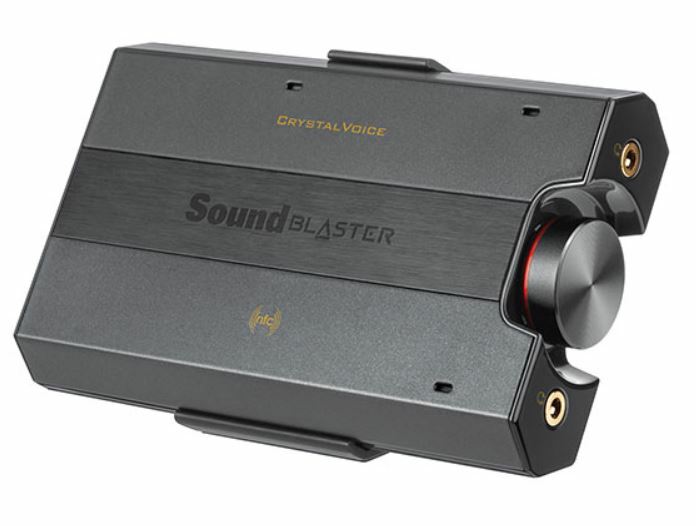 Also, like with the other Sound Blaster products we have reviewed, they loudly and proudly point out that they have sold over 400 million PC audio products, and are #1 in the field. The bottom of the box lists the contents and has a long legal disclaimer. 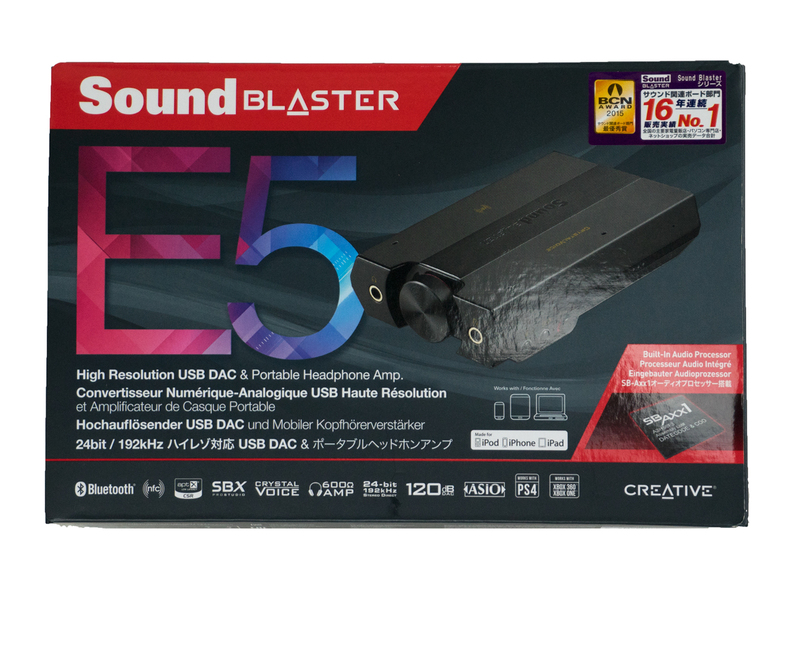 The Sound Blaster E5 we found to be a extremely well rounded and versatile product that never ceased to amaze us with its features and capability.